Twenty-eight years ago this month, four of Ireland’s greatest milers -- two of whom attained greatness at Villanova -- combined to set a World Record of 15:49.08 in the 4-mile relay at Dublin’s Belfield Stadium (see video above). Eamonn Coghlan, recovering from niggling injuries and pushed by the “B” team’s John Treacy the entire way, led off in 4:00.2. Coghlan handed the baton to fellow Villanovan Marcus O’Sullivan, who proceeded to run the quickest split (3:55.3) of the day. Marcus turned it over to Frank O’Mara, who ran 3:56.6, and Ray Flynn anchored in 3:57.0. That O'Sullivan-to-O'Mara handoff involved two men who went on to win a combined 5 world championships (O'Mara two at 3000i meters; O'Sullivan three at 1500i meters). On that day in Dublin they ran the two fastest legs in a world record effort that has yet, nearly three decades later, to be eclipsed. The previous mark of 15:59.57 was set by a John Walker-led New Zealand team in 1983. No foursome has been able to best this 1985 mark in the intervening years. Flash ahead 28 years to the present. This month, Frank O'Mara returned the favor: he handed off his son Colin to Marcus. 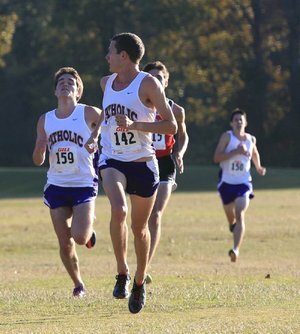 Colin O'Mara (bib 159, right), who recently graduated from Catholic High School in Little Rock, Arkansas, will attend Villanova and compete under Marcus's tutelage for Villanova track and cross country. He'll be teammates with Marcus's son Chris. The two sons may someday soon exchange the baton on a Villanova relay team, closing the circle of a record-setting Irish relay exchange from 1985. Coghlan: "Helsinki was my redemption, for sure"